Recently, following an unfortunate accident with a water bottle, I was forced to retire the very first suit skirt I ever purchased. Saying goodbye to that skirt reminded me of the overwhelming task of finding my very first suit back when I was a law student. Purchasing a suit to enter the legal profession must be so much easier for men. Most guys have lots of practice choosing suits because they have worn them for every special occasion since birth. If shopping for your first work wardrobe consisted of picking up a few party dresses, it would be no sweat for us women either! Unfortunately, for those of us whose first real job is a legal one, the task of choosing a first suit can be as daunting as it is novel. Even if you pick the most expensive, fancy brand for your suit, check for quality nonetheless. A high quality suit is lined and 100% wool. Lining is essential for three reasons: the jacket will fall better; the extra layer prevents wear and keeps the suit cleaner; and wool can be itchy on your skin. One friend suggested that the 100% wool rule does not work in the summer. I agree that there are decent-looking wool and polyester blends out there; however, it takes experience to differentiate between high quality and “cheap looking” synthetic fibres in suits, so I would suggest staying away from those. If your summer job involves running all over town, more expensive labels (e.g. Theory rather than Banana Republic) tend to carry summer-weight suits that are still 100% wool. Even if you know where you will be working, it is difficult to understand the dress code from the outside. Sometimes it varies between floors or departments within the same office. This reminds me of the advice my mother used to give me every school year, where I was only allowed one new outfit before the first day of school: “You can choose some new clothes after you see what the other kids are wearing!” Plus, your taste in styles of suits will change the more you wear them. For jackets, make sure they fit your shoulders perfectly because a tailor cannot fix this, and make sure not to buy anything too tight in the bust. If you are curvy, you will need to have most jackets taken in at the waist. Plus sizes and petites are difficult to find in the lower price ranges. Laura’s plus size department has some surprisingly good finds. 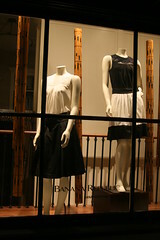 Banana Republic’s petite line is great for those on the shorter side. If you find most suits too big for you due to vanity sizing, but you are above 5’4”, the cheapest option is to mix a Banana Republic Petite jacket with Club Monaco pants. So, please tell us: Did my friends and I forget anything? What have you learned about purchasing a suit that you would tell your law student self? Start the discussion by leaving a comment below.